“Wait, they don’t love you like I love you,” sang Yeah Yeah Yeahs lead singer Karen O on their emotional 2003 single ‘Maps’. Shed a tear, it’s alright. Now, it’s pretty obvious that Ms. O wasn’t talking about her love of ordinance survey maps, or indeed Google Earth. But we are: after all, that’s why you’ve clicked on this here page. Maps apps are a godsend, rescuing us from the directionless pickles we so often find ourselves in whilst out driving, running or simply walking around an unfamiliar town. Here, then, is our take on the best map apps available to download for your smartphone or tablet. This map app from Telenav is straight to the point regarding what it has to offer: premium navigation services, global maps (including one entire country for offline use! ), and live traffic data – all in all, it’s an impressive package from the German developers. Previously known as ‘skobbler’, Scout claims to be “the only truly complete online and offline solution” for both drivers and pedestrians. It’s also well and truly free, which has unsurprisingly earned it plenty of attention on the various app stores. With an endearing little ghost mascot (ever-so-slightly reminiscent of Boo from the Super Mario series) on board, Waze really do have all exits covered when it comes to aiding (and amusing) you in your navigational needs. A community-based service that provides up-to-the-minute traffic updates from your fellow drivers, Waze aims to help you save time, fuel and stress during the daily commute. And judging by the excellent feedback that the app has received, it’s obviously working: once you join up you become part of the Waze community, helping your fellow man by faithfully reporting traffic hazards, jams and other nasty road-related problems. You’re such a Samaritan. In direct competition with Waze is Navmii, another community-based traffic app that aims to help you avoid the traffic at every opportunity. With voice-guided navigation, local search and free offline navigation (for when you’re stuck in the middle of nowhere, yet there’s still a traffic jam – it happens), Navmii is an ultimately-fine service that’s used by over 23 million users the world over – and 23 million people can’t be wrong, right? One for the walkers, the ramblers, and the climbers amongst you: ViewRanger helps mould your “outdoor experience” by providing Ordinance Survey maps, GPS (even without signal! ), and 1000s of trail guides for you to explore at your leisure, whether you’re into countryside ambles or climbing up Everest. It’s also “used and trusted by over 200 mountain and lowland search and rescue teams”, which is a pretty fine endorsement if you ask me – and I believe you did indeed ask me, so there you have it. Ahh, Google. It answers our stupidest questions, it receives and sends our emails, and now it tells us how to get from one place to the other. Chances are that you already knew that, so is this entry in our list pretty pointless? Not at all: Google Maps is a formidable map app in that it offers comprehensive satellite coverage of over 220 countries (sorry, North Korea), street view, live traffic conditions, and detailed information on more than 100 million places – and that’s just the tip of the iceberg in terms of its navigational features. It’s certainly a map app that you can trust. Transport! If you ride a bus, take the train or ride the subway, then Citymapper could be your vital companion. Operating under the mission statement that they want “to make cities easier to use” – particularly the world’s most “complicated” cities – it’s good news if you live in either London, Manchester, Birmingham, Hong Kong, Singapore, Toronto, Vancouver, Montreal, Brussels, Paris, Lyon, Amsterdam, Lisbon, Madrid, Barcelona, Milan, Rome, Berlin, Hamburg, New York City, Washington DC, Boston, Philadelphia, San Francisco, Los Angeles, Chicago, Mexico City, São Paulo, or Tokyo – because you can then use the app’s route planner, observe its real-time data and even check on how many calories you’ve burned. 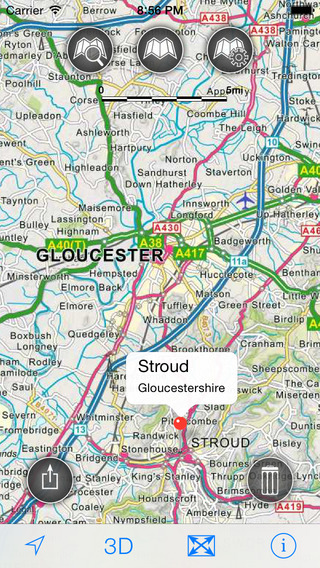 Providing an online AND offline service, JOMO Solutions’ GB Maps LT app is a handy – and free! – service that you should take full advantage of before it’s too late. Acting as a guiding aid whether you’re walking, driving or taking public transport, this map app will direct you out of whatever troubled waters you encounter – it even works for canals, rivers and the sea. The sea! With an offline search functionality that can take in nearly 260,000 GB locations, you can zoom, pan and rotate this interactive map to get the answers you need. Frequently finding yourself lost when you’re out of phone signal? Pah – that’s no longer a problem. Or at least not when you have the Offline Maps & Navigation app on your Android phone it’s not, anyway. A free service that provides offline GPS navigation and maps, speed limit warnings for when you’re driving, and support for over 33 different languages, it’s a fine alternative to some of the more established navigational tools out there for your smartphone or tablet. No, not Simon Cowell’s next vampiric venture – MapFactor is actually something that’ll benefit the human race (miaow). A free turn-by-turn GPS service, MapFactor offers voice guidance, monthly updates, and offline capabilities for hundreds of countries the world over, with plenty more features to explore at your leisure – which is something you can do whilst sitting in the unavoidable traffic on the daily commute home! Right here, right now: Nokia’s foray into the map app world has taken shape in the form of HERE maps, a very directly-named platform that tells you that the Germans are HERE, HERE AND HERE (or something else less WW2-y). “Here’s to finding your way no matter where you are. Here’s to embracing the world around you and daring to explore new places without worrying about getting lost. Here’s to having the confidence to live your life, because you always know exactly where you’re going.” It’s a deep mission statement that’s being delivered by Nokia, but maybe their well-received service – with provisions for over 100 countries – is worthy of the hype. With the now-standard features of voice navigation, live traffic updates and offline capabilities, it’s certainly a map app worth thinking about.